As chiropractors, Dr. Anna and Dr. Monica focus on the health and function of your nervous system. You may be surprised to hear that your body and brain’s ability to communicate is facilitated by the nervous system. The chemical, physical and emotional stresses of life can cause subluxations that interfere with the communication between your brain and body. We utilize advanced scanning technology from Insight™ to understand how your nervous system is functioning. If there is interference in your nervous system, your brain and body can’t talk to each other as they should. 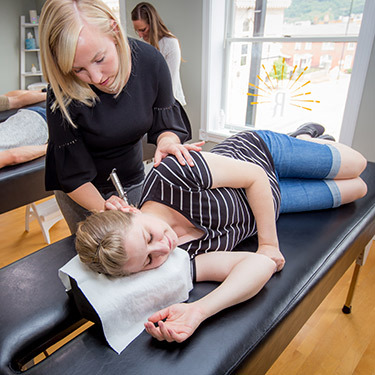 Our goal is to make sure that your body has the tools it needs to remove the interference, allowing you to adapt to stresses and operate at your highest capacity. Pregnant women find that when they’re adjusted their body is more at ease and relaxed. Chiropractic care helps ensure that your body is in an ideal position for you and your growing baby. Our gentle approach instills calmness into your system; calm mom equals calm baby! We are here to support, empower and inspire you during your beautiful pregnancy. Research shows that women who receive chiropractic care during pregnancy experience a significant reduction in labor time. Birth is a beautiful, natural process but it can be a traumatic experience for a baby even in the most natural birthing situations. It’s important to have your little one checked soon after birth to ensure that their nervous system is functioning without interference. Since everything in life is perceived through the nervous system, we want to ensure your little one is clear and ready to enjoy this great new world! Chiropractic adjustments have been shown to help little ones with issues related to feeding, sleeping, colic as well as calming the baby! As the children get older, they go through milestones like learning to crawl, walk and ride a bicycle. Every time a slip or fall happens, it’s a microtrauma that affects the body. If ignored, these interferences in the nervous system can manifest as symptoms. Chiropractic care can help with common issues such as ADD/ADHD, ear infections, frequent illness, colic and digestive troubles. Though common, these issues are far from normal. We can ensure that your child has an interference-free body, expressing health at their fullest capacity so they can learn, play and enjoy being a kid! Chiropractic care for the whole family is so important! We are passionate about creating healthy families that can heal and thrive together. When the whole family is functioning well and feeling great, it allows you to truly enjoy each and every moment of life! We have gone above and beyond to ensure our care is affordable for the entire family. At Revival Chiropractic, our technique analyzes your body’s neurological health and works with your innate intelligence. This allows your body to heal itself like it is intended to do! These gentle, calming methods are great for everyone even newborns and pregnant women. There is no twisting, cracking or popping involved at our office! Our techniques include Torque Release Technique, MC2 and Talsky Tonal. Ready to begin your family’s journey to higher health? Contact us today to schedule your first appointment.